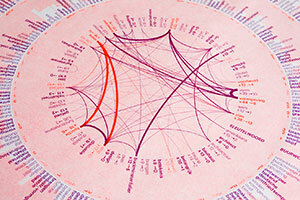 TextCompass is a software designed for text analysis and network visualization. 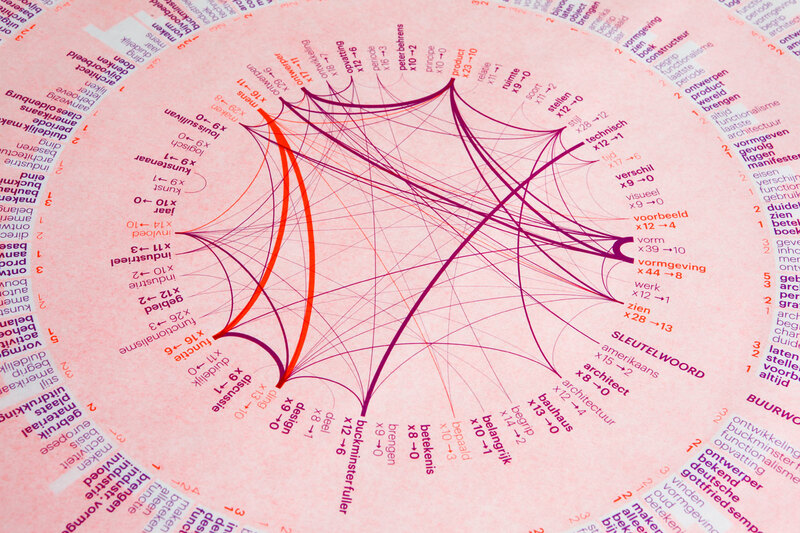 From a given text, it renders a hypergraph that visualizes connections between related words based on their semantic context. 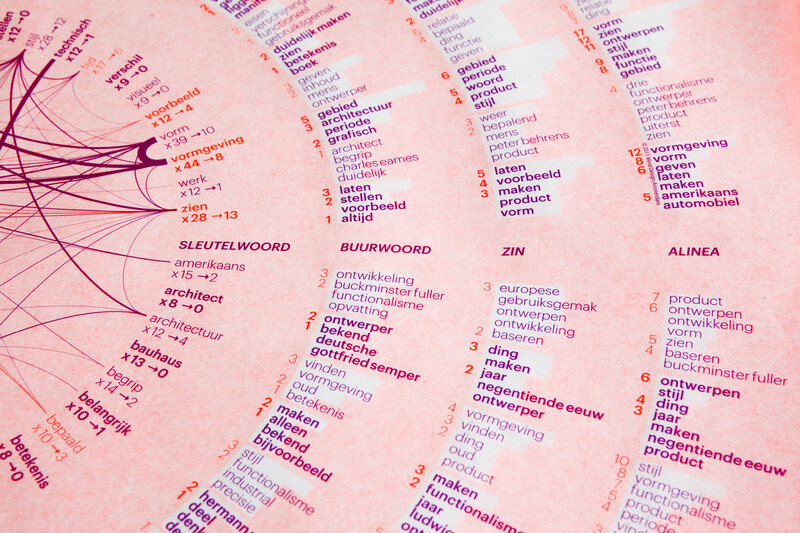 The concept of TextCompass was presented for the first time to the public during the Items Live 12 lectures at Stedelijk Museum Amsterdam, on the occasion of Wim Crouwel’s exhibition A Graphic Odyssey. 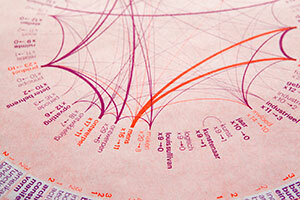 To capture Wim Crouwel’s visionary approach to graphic design and to understand what makes his design so unique, two inaugural speeches from his time as a professor at Delft University of Technology and Erasmus University in Rotterdam were fed into the software to produce the presented network visualization. 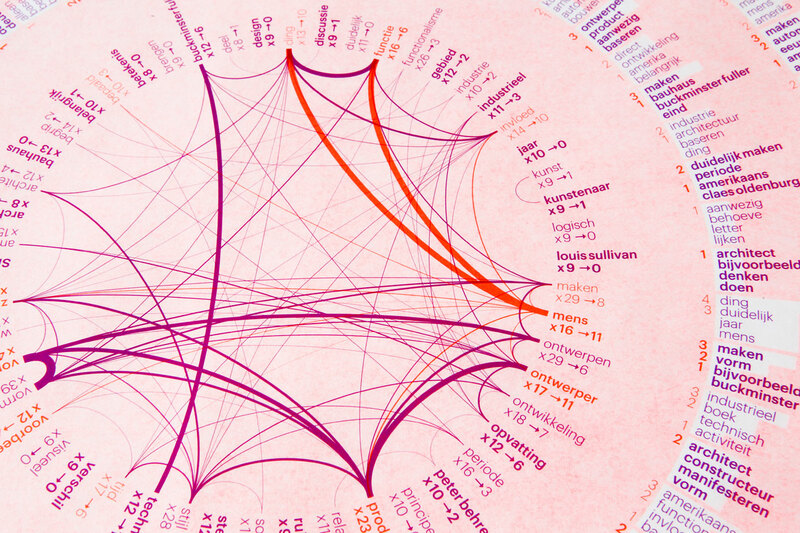 The infographic shows the links between keywords extracted from the speeches and the context in which they are used. The first ring presents the most meaningful words together with their number of occurrences. 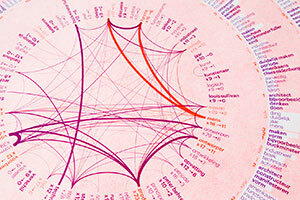 The outer rings define their context: immediate neighbors (second ring), words co-occurring in the same sentence (third ring) and paragraph (fourth ring). 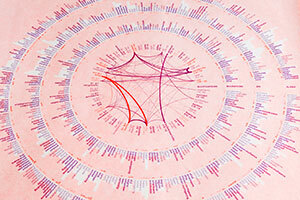 The center of the graph visualizes the links between the keywords, based on how much context they have in common. 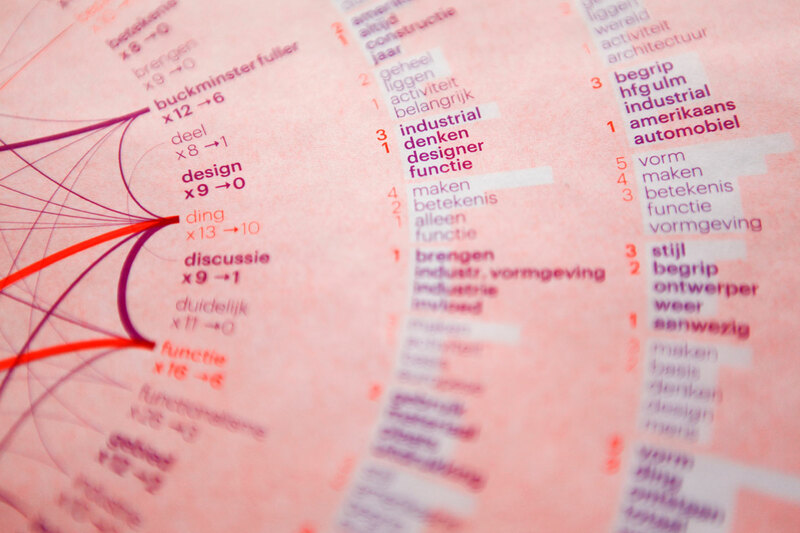 Starting from Louis Sullivan’s influential design principle “form follows function”, this cause-and-effect of design and its purpose is, at first glance, clearly embedded in a context of industrial concepts like ding (thing), product, stijl (style) and materiaal (material). 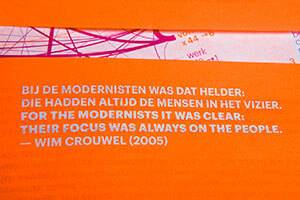 But upon closer inspection, an interesting observation emerges from Wim Crouwel’s statement on design. 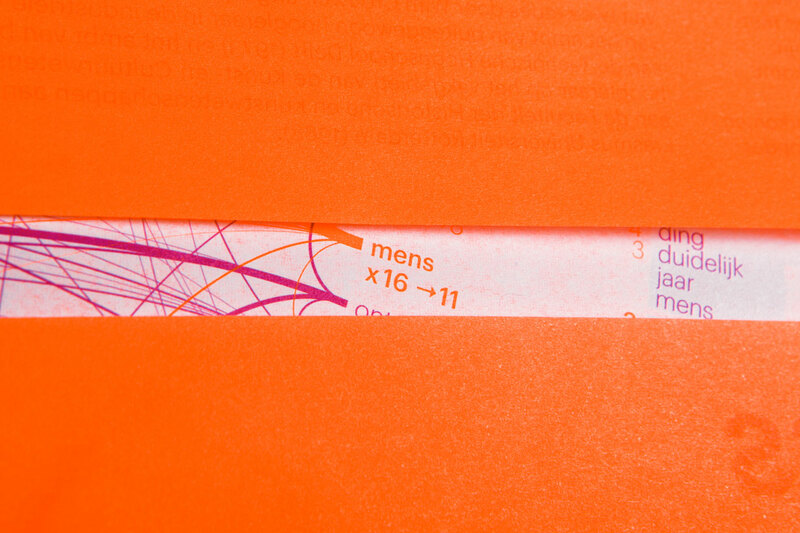 Strong links point to the seemingly unimportant word mens (human) and reveal what most designers tend to forget: the social aspect and the fact that we design objects for people. 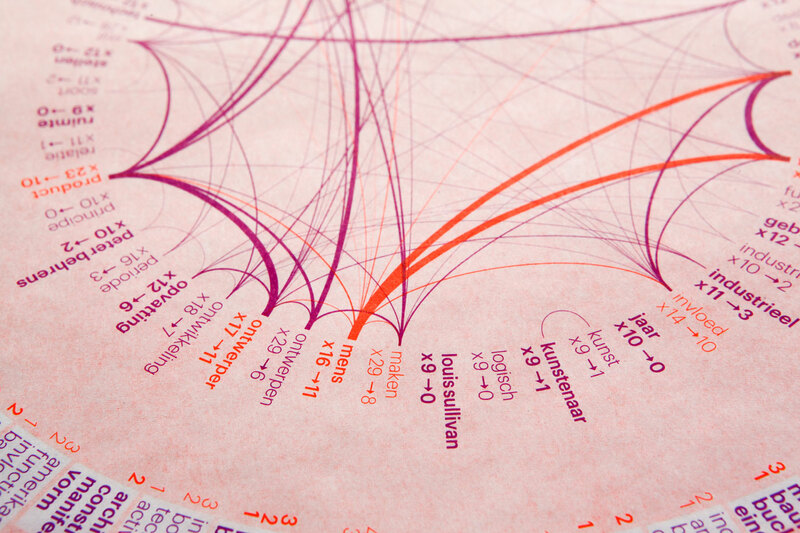 The relevance of a word is determined by the number of references in a text. 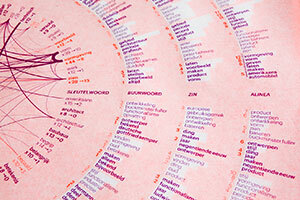 The top 50 keywords listed in alphabetical order. Context facilitates understanding, as words can not be defined or understood without other words around them. 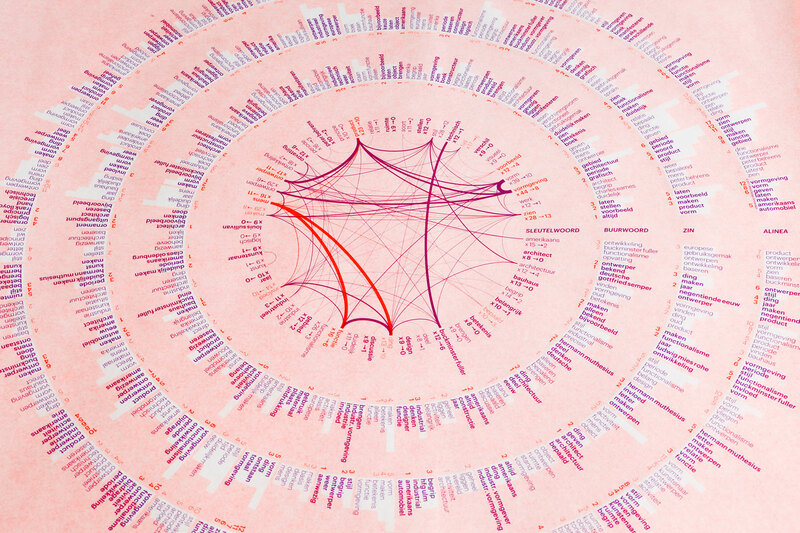 A connection is built on how many words are in common in the contexts of the two words. The more context two words have in common the stronger their connection. 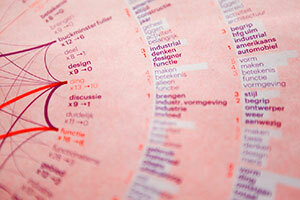 Wim Crouwel reminds designers what most of them tend to forget: the fact that we design objects for people. 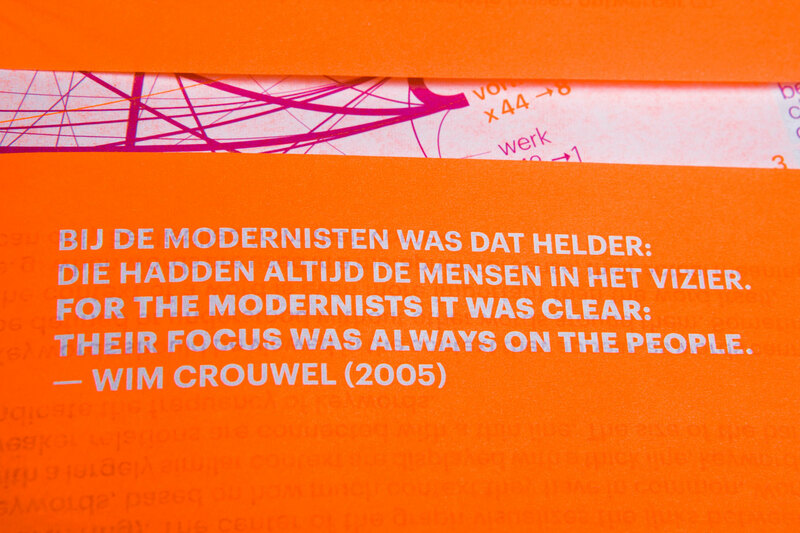 A quote from an interview with Wim Crouwel in the Dutch newspaper de Volkskrant.